Ray St. Clair Roofing, Inc. is your trusted roofer and so much more! We are a third-generation family owned and operated business with one of the finest reputations in the local home improvement industry. We have been offering our services in the Greater Cincinnati, Northern Kentucky and Southeast Indiana regions for almost 60 years. The cornerstone of our business since the beginning has been our firm commitment to excellence and to customer satisfaction. Our passion for offering our clients nothing but the best has led us into partnerships with some of the country’s top manufacturers, including Gutter Helmet®, Tamko®, GAF®, CertainTeed, VELUX®, Owens Corning® and Carlisle®. All our installation professionals have been trained in the classroom and on the job to meet our manufacturers’ high standards for workmanship. From our three-man crew way back in 1954, we have grown to a staff of 80+ skilled workers and a client base of more than 70,000 homes and businesses. 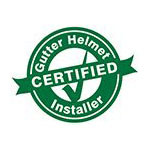 Ray St. Clair Roofing, Inc. is proud to be an authorized dealer for Gutter Helmet®, the undisputed number one gutter protection system in North America. More than 80 million feet of Gutter Helmet® has been installed on homes and buildings across the country—a testament to the brand’s 30+ years of excellence in sales and service. Call us today at (800) 824-3772 to receive a free, no-obligation quote or fill out our online form to schedule a free in-home appointment. Our sales representatives will be more than happy to assist you in your inquiries.